Lovely indexed road map of St. Lucia, with street plans of central Castries and the holiday complex at Anse Chastanet. 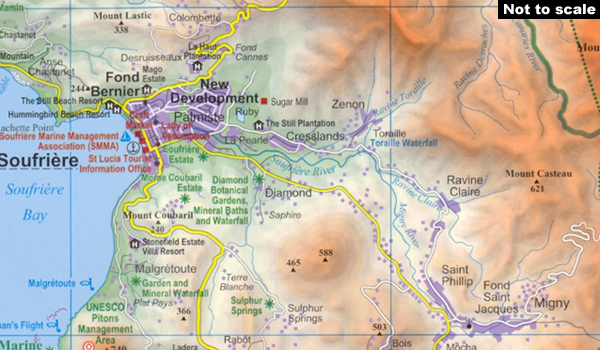 Bright altitude colouring and vivid relief shading provide an excellent picture of the islands topography. Mangroves and coral reefs are marked. Road network includes minor local roads and tracks. The map also shows the country’s administrative divisions. Protected nature areas and animal watching locations are marked and the map highlights hotels and tourist accommodation, waymarked hiking trails, sites for scuba diving, watersports and deep see fishing, golf courses, various places of interest and natural curiosities, etc. The map has a 2’ latitude/longitude grid and is indexed. 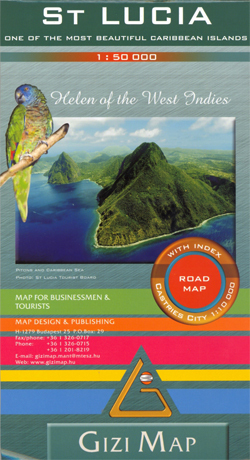 Also included are street plans of central Castries and the holiday complex at Anse Chastenet, plus an overview map of the southern Caribbean.